The literature reveals a wide range of missed lung cancer rates on Chest Radiographs. 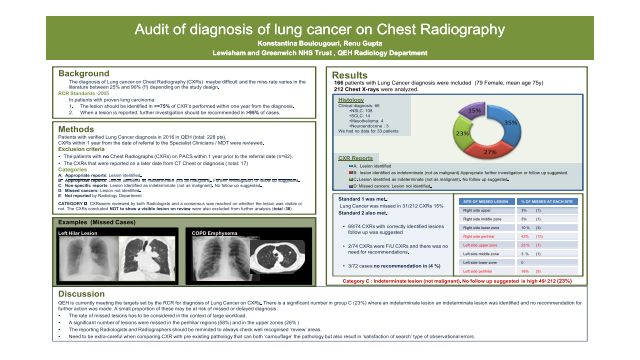 We did this audit to compare our department’s accuracy in Lung cancer diagnosis on Chest Radiographs to the RCR standards set in 2005. All the patients with verified Lung /Pleura Cancer diagnosis in 2016 in our hospital were identified from the MDT register (total: 228 pts). The patients who had Chest Radiographs within 1 year prior to the referral to the Specialist Clinicians or MDT were included (166 pts). The CXRs that were reported on a later date from CT Chest (total: 17) were excluded. A: Appropriate reports: Lesion identified. Investigation or follow up suggested. C: Non-specific reports: Lesion identified as indeterminate (not as malignant). No follow up suggested. D: Missed cancers: Lesion not identified. The CXRs classified as D were then reviewed by both Radiologists. The CXRs concluded not to show a visible lesion on review were also excluded from further analysis. A total of 212 Chest X-rays were analyzed. The department met both the targets set by the RCR standards. There is however concern about the significant percentage of Radiographs with indeterminate findings with no suggestion for follow up (23%) that may contribute to delayed diagnosis. The emphasis should be on creating robust pathways to fast track and secure the timely communication of the results and on increasing staff awareness. The reporting Radiologists and Radiographers should be reminded to always check well recognised ‘review’ areas and to be extra-careful when comparing CXRs with pre - existing pathology that can both ‘camouflage’ the pathology but also result in ‘satisfaction of search’ type of observational errors.